In a changing Seattle, efforts are underway to measure and preserve our leafy canopy. Not all neighborhoods have the same amount of tree canopy; some south-end areas have as little as 6 percent, while those in the north, such as Fremont pictured here, have a much higher percentage. Wolf knows this research well, because her own work is focused on how people experience nature in cities, including the human health and economic benefits of the urban forest—the phrase used to describe the trees and understory plants in a city. Forest bathing aside, research shows our health is boosted by having access to urban trees and other nature. “Neighborhood greening reduces depression, may help kids reduce ADHD symptoms, reduces our stress response, encourages physical activity, reduces signs of mental distress, increases cognitive memory, improves air quality and, overall, promotes significantly higher well-being,” she says. City trees can also raise property values, reduce crime and muffle urban noise. They help the environment, absorbing water, decreasing flooding and the need for water treatment, and absorbing and storing carbon dioxide, directly fighting climate change. “Up until recently, trees really didn’t have a place at the table with city decision making, but now, because we know about their environmental services and the health benefits, trees are an important component of city decision making,” says Wolf. Documenting these benefits is more important than ever as Seattle grows. The city’s population has swelled from 608,000 in 2010 to more than 713,000 this year. In the 1970s, Seattle was mantled with trees, with about 40 percent canopy cover—that is, the percentage of the city that is covered by trees, as seen in an aerial view. But as the number of city inhabitants has increased, we’ve shed at least a quarter of that protective green veil. And what’s left is distributed unevenly, and is under threat from disease and development. This spring, the city released the results of a 2016 study of Seattle’s tree canopy. Several previous assessments, starting in 2001, used a range of methods to measure the tree canopy, making it impossible to directly compare studies. One assessment from 2001 found the canopy was only 18 percent, while the 2016 research found a more robust 28 percent—close to the city’s 2037 goal of 30 percent. It was a respectable number, although well under the “reach” goal of 40 percent, which the city would like to achieve by 2047, based on a recommendation by the national conservation organization American Forests. The 2016 survey was conducted with a technology called light detection and ranging, or LIDAR, in which a sensor-equipped plane collects data to create a three-dimensional model of the Earth’s surface and surface characteristics, such as trees. But the report doesn’t indicate the condition of these trees. “Many of our urban trees in our natural areas are at the end of their life expectancy,” explains Sandra Pinto de Bader, urban forestry adviser at Seattle’s Office of Sustainability and Environment, in a presentation about the findings. In addition, invasive English ivy throughout the city is weakening some trees, and the impacts of hotter, drier summers, as well as more serious droughts, as we experienced in 2015, are also weakening many trees. “It would just take a couple of nasty storms for us to lose a significant number of trees,” Pinto de Bader says, though she notes that she doesn’t have hard data to back this up. Knowing something about the state of the city’s tree canopy may help planners as Seattle’s population and density increase. Seattle already has several tree planting and maintenance initiatives, including a program to plant about 2,000 trees every year, and the Green Seattle Partnership (an initiative between the Seattle-based sustainability nonprofit Forterra and Seattle Parks and Recreation), which restores aging, ailing urban forests by planting native understory, pulling invasive species and planting 5,000–7,000 trees annually. A Trees for Neighborhoods program offers residents as many as six trees per household to plant. King County also has a campaign—to plant 1 million trees by 2020. What’s not known is whether these efforts are keeping up with the pace of loss from disease and development. A “mini assessment” included with the canopy survey provides some insight into how development might impact canopy cover over time. Researchers used historical imagery from Google Earth to look for changes in tree canopy on 80 randomly selected parcels in the city, and found that parcels in the downtown, industrial, single- and multi-family zones lost canopy when developed. Anyone looking around the city can see how that happens: A small single-family house on a big, treed lot comes down, and the lot is scraped bare, or nearly so. When four units sprout up, there’s scarce room for new trees, particularly ones that need space to grow big. The same can happen with larger developments. And homeowners can remove as many as three trees on their property per year. Residential areas of the city—with both single- and multi-family housing—are a particular concern: They provide 72 percent of the city’s tree cover, while parks and other natural areas provide only 20 percent. “The city government doesn’t have full control over the majority of our urban trees,” explains Pinto de Bader. In fact, Seattle has fairly weak protections for trees on private property. An ordinance protects “exceptional trees,” which are generally large, unusual or old, and the city can fine property owners for cutting down those trees. But homeowners often find ways to get around that ordinance, for instance, with a private arborist’s report deeming the tree a hazard. Homeowners can apply for a Heritage Tree designation, which provides a certificate, but no protection. 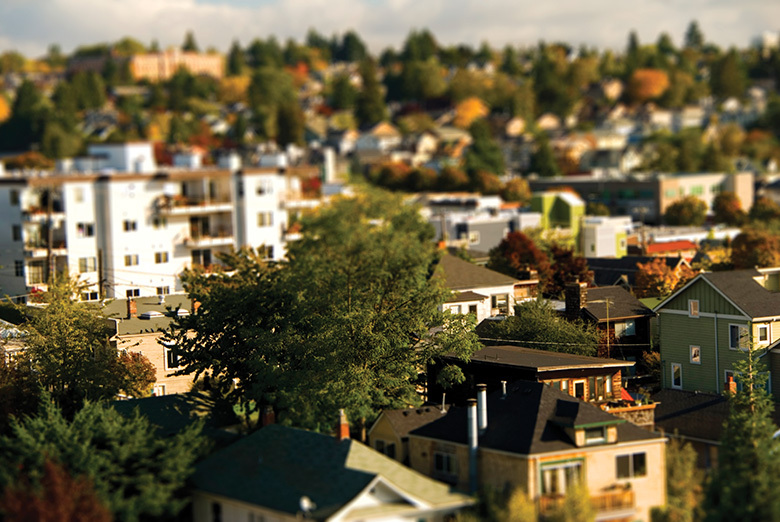 Seattle residents are also worried about trees lost to larger developments. “We’re proudly the Emerald City, but I don’t know if that’s money or trees,” says Tony Hacker, a psychologist in private practice who lives in Madison Valley. His and other homes on his street face a slope of several dozen trees, including Lombardy poplar, cherry, maple and cedar trees. The slope is the back side of a large commercial property that houses City People’s Garden Store, a home and garden shop. Developers who purchased the site with plans for retail, apartments and a parking garage would like to remove most of that green (as well as the store building). The new view from Hacker’s window would be of a concrete wall. Hacker and other neighbors belonging to Save Madison Valley have filed legal action to force the city to evaluate the development for its impact on the neighborhood, including tree loss. “We’d like to see a comparable ecological system put in place, so in another couple of decades, there’s another canopy in place that at least replaces what they’re taking away,” he says. The Madison Valley activists aren’t alone. In many neighborhoods, residents are pleading with the city to save beloved trees located on property slated for development. In other neighborhoods, there simply aren’t many trees, and, according to the canopy report, those communities tend to have more people of color and lower incomes. The difference is eye-opening. South Park, on the Duwamish River, has only about 6 percent tree canopy, the lowest of any Seattle neighborhood, compared with about 28–31 percent for some northeast Seattle areas. South Park residents also have life expectancy estimates falling far short of most other areas of Seattle, at 73.3 years. In wealthy Laurelhurst, one of those high-canopy northeast neighborhoods, life expectancy is 86.4 years. One of the most significant health issues in South Park is asthma in both adults and children, with a rate that’s more than one-third higher than the city’s overall asthma rate. This neighborhood also has some of the highest levels of air pollution in the city, which can trigger and worsen asthma symptoms. Lopez says she knows that impacts on health are cumulative, and she works on educating families about health issues, but trees could help. The city has now mapped canopy cover to the level of individual parcels, and Lopez would particularly love to see intentional tree planting in the locations where the highest number of kids have asthma. Urban tree canopies benefit the environment as well as the health of people living in cities. According to conservation organization American Forests, one tree can absorb 10 pounds of air pollutants a year and produce nearly 260 pounds of oxygen. Trees are fairly cheap to buy and plant, but they need watering, pruning and a cleanup crew for their leaves, cones and berries. They also take up square footage that could be developed for housing or other uses. For these reasons, trees are viewed as a cost. Adding up the benefits of trees allows cities to justify maintaining an abundant canopy, but municipalities still struggle to support these initiatives. Seattle lawyer and business owner Mark McPherson wants to help. He’s the executive director of the Seattle-based Urban Forest Carbon Registry (UFCR), set to launch November 1, which aims to generate money for urban tree planting. McPherson grew up in a small city in Michigan, playing under a canopy of elms. By the time he was 11, all of those trees were dying of Dutch elm disease. “I think that experience actually made me realize—in my heart, in my gut—that trees can go away,” he says. McPherson wants to prevent that by offering carbon offsets that are generated exclusively by planting urban and suburban trees in cities around the world. Many people have heard of carbon offsets in connection with travel; for instance, if you take a flight from Seattle to Paris, you can calculate how much carbon was emitted to get you to Paris [an estimated 1.17 metric tons, it turns out] and buy offsets from an organization that promises to make up for your emissions by trapping carbon by one method or another. One common method is planting trees, because trees absorb carbon dioxide, and scientists can estimate the amount a tree will likely trap in its lifetime—about 48 pounds per year for a mature tree, according to American Forests. Many companies—including Microsoft, Amazon and Starbucks—buy huge numbers of offsets for emissions from fossil fuel energy used to power buildings and facilities. McPherson’s organization acts as a conduit to help sell offsets that are used to plant trees specifically in cities and the suburbs. A company would sign on to the registry, and a certified organization doing urban forest planting and preservation projects would receive carbon dollars through UFCR to plant or maintain city trees. “No carbon [offset] dollars are flowing to urban forests,” he says, “which makes no sense, because 80 percent of people [in the U.S.] live in cities and towns.” Over the past decade, $700 million was spent on carbon credits. McPherson hopes cities can peel off a few dollars from the stack for city trees. Sitting on a bench on a hot day at Seattle Center, sheltered by trees and serenaded by birds, McPherson considers where he would put all these trees in Seattle, as he takes in a bird’s-eye view of Seattle through Google Maps. The gray grid of development, such as roads, rooftops and parking lots, seems to dominate in the images, while tiny trees, like fluffy green clouds, soften edges. McPherson points out a few obvious spots for planting, such as at the University of Washington’s massive parking lot north of Husky Stadium, which now comprises nearly 20 acres of uninterrupted concrete. He also points to tree-bare streets on Beacon Hill, along Rainier Avenue S and in the streets of South Park. It seems there’s no shortage of places to plant a tree. Alone, a growing tree canopy can’t put a lid on Seattle’s growing pains, or solve our health, equity or climate change problems. But it does increase the chance of a solution. To determine where new tree plantings would be most effective, and to ensure that new trees provide maximum benefits for birds and wildlife as well as humans, Seattle Audubon this summer launched a four-year Neighborhood Flyways Campaign, with the intent of creating a more continuous canopy in the city by better connecting public urban forest and private yards. Flyways are flight paths for migratory birds, and Seattle Audubon wants Seattle to maintain its role in the Pacific Flyway, which stretches from Alaska to the Patagonia region. “We play a role as a link in that chain,” says Seattle Audubon executive director John Brosnan. To that end, the group is gathering data on the “highest-quality” bird travel pathways across the city, looking for gaps where plantings and restoration would make a difference. Once the group finds those gaps, it intends to bring the information to the community, and engage people in closing the gaps. “We need to pay attention to each type and have a strategy for conserving, restoring and enhancing habitat values in each place,” says Brosnan. The group’s work is informed by sobering statistics about the future of birds, such as this one: Fifty percent of North American birds are at risk of losing habitat by 2080 because of climate change. Learn more about this project at Seattle Audubon.